In the spirit of the Sydney Opera House, Paris’ Eiffel Tower, the St. Louis Gateway Arch and even the Washington Monument, the iconic guitar hotel tower under construction at Seminole Hard Rock Hotel & Casino, Hollywood is soon to become one of the world’s most recognised landmarks. 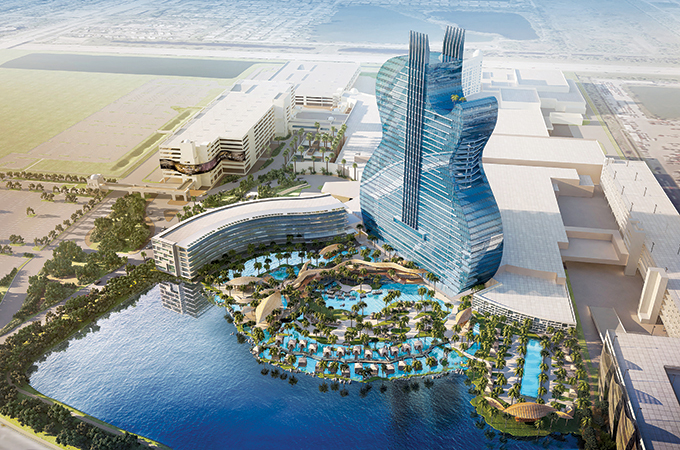 Designed to resemble back-to-back guitars, with guitar faces, necks and brightly lit guitar strings that reach 450 feet into the sky on both sides, the iconic Hard Rock guitar tower is under construction as part of a $1.5 billion expansion of Seminole Hard Rock Hotel & Casino, Hollywood. The giant guitar tower will be the centrepiece of one of the world’s most elaborate casino complexes, including a Hard Rock Casino nearly double its current size with 3,267 slot machines and 178 table games such as blackjack and baccarat, plus a new 18,000-square foot poker room. The expansion will also include 60,000 square feet of new retail and restaurant space and a $100 million redesigned and completely rebuilt Hard Rock Live venue with 7,000 seats in a theatre-style configuration. The expansion of Seminole Hard Rock Hotel & Casino will open in mid-2019, in advance of Super Bowl LIV at nearby Hard Rock Stadium in February 2020. Leaders of the Seminole Tribe of Florida and Seminole Gaming, who own and operate the casino complex, gathered today on the expansion site to celebrate its construction progress with a traditional Hard Rock “Guitar Smash” ceremony and community event. The expansion will include 806 additional guestrooms and suites, with 638 in the iconic guitar hotel tower, where all guestrooms will be 525 square feet or larger. An additional 168 guestrooms and suites will be located in a seven-storey Pool Tower that will flank the pool complex. It will bring the total number of guestrooms and suites at the Seminole Hard Rock Hollywood to more than 1,300. Other amenities will include restaurants, lounges, a business centre and a 41,000-square foot spa. The popular 5,500-seat Hard Rock Live arena will be razed in March 2018, and replaced with a state-of-the-art 7,000-seat Hard Rock Live in a theatre-style configuration. Designed by Montreal-based Sceno Plus, one of the world’s leading designers of theatrical venues, the new Hard Rock Live will house its own television studio and broadcast centre to produce and televise awards shows and other events. It will also open in mid-2019. Once the new Hard Rock Live venue opens, the temporary performance hall will become a 37,000-square foot ballroom. It will more than triple the amount of meeting space at the Seminole Hard Rock complex, offering a grand total of 141,000 square feet of meeting space in a new Seminole Hard Rock Conference Centre.